Cube grow lens - 5 pack. 3mm to 2cm growth. Just add water. Student and lab experiment use Science fair project. Preparation: Put the Grow Lenses or Grow Cubes into a large, clean glass jar and fill it approximately ¾ full with distilled water and wait overnight (tap water is usually OK). Remember, each Grow Lens will grow to the size of a big marble, so leave a lot of extra room. General Use: Once hydrated, Grow Lenses should stay full for a number of days even when out of water. Store them in water for longer periods. They are slippery and fragile! Give students a paper towel to hold their lenses when not in use. Rinse lenses in water if they get dirty. 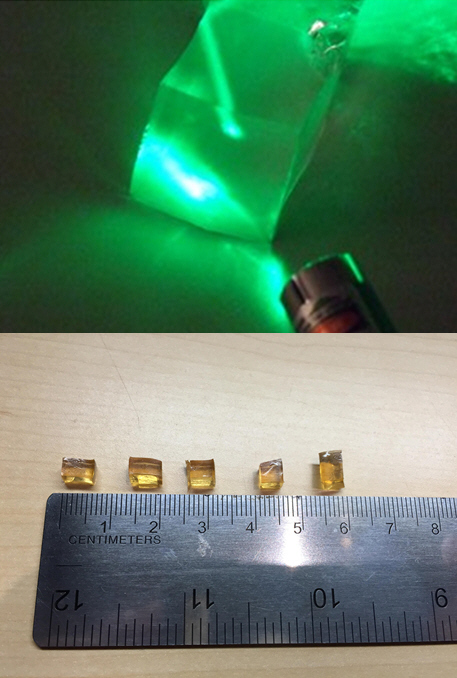 Ray Optics: Use a laser pen with the Grow Lens and Grow Cube. (This works best in dim light and with dyed Grow Lenses.) . Image Formation: Hold the lenses above text and images (either laminate or put pages in a zip top bag) and investigate how images are formed through the lenses. Osmosis: Pile salt onto the top of a Grow Lens and onto a Grow Cube. Osmosis through the semi-permeable membrane drives salt into the material and, as water streams out, the material shrinks back to its original size. The salted top of a Grow Cube takes on a saddle shape as it shrinks but the spherical Grow Lens can't tolerate any shrinkage of its outside layer because a sphere already has the minimum ratio of surface area to internal volume. The surface of the shrinking sphere rips open and the Grow Lens collapses into many pieces!